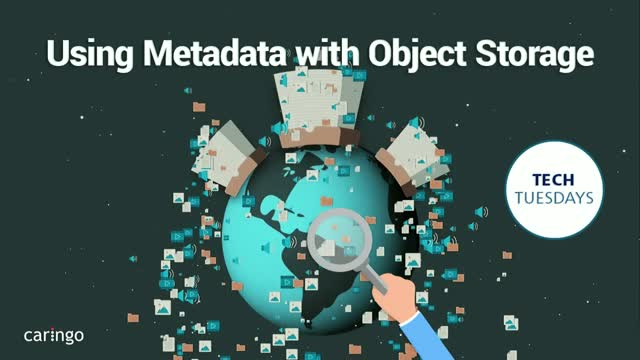 Metadata is data about the data, but how does it work with object storage? What benefits can you reap by using metadata, and do all object storage solutions use metadata the same way? In this Tech Tuesday webinar, Ryan Meek will take a deep dive on metadata and explain how it can be used to unlock the intelligence potential that resides in large data repositories. FileFly is the solution you need for complete, automated and flexible data lifecycle management of unstructured data—from creation to preservation. Working with both NetApp and Windows filers, FileFly allows you to set policies that guide the level and target of file data movement based on your organization’s requirements. Senior Consultants John Bell and Tony Lokko explain how FileFly works and can now be used with any of the Big 3 cloud providers (Azure, Google and Amazon) as well as Caringo Swarm Object Storage. They will demonstrate use of FileFly and have a live Q&A session so you can learn from their extensive experience in architecting, deploying and managing storage solutions. Digital video and M&E workflows are changing rapidly driven by distributed workforces and on-demand content consumption. In this webinar, you will learn how to stream content directly from storage, how to set up multi-site content distribution for collaboration, how to unify file system (NFS) and RESTful (S3) workloads, and the pros and cons of using object storage vs tape. In this webinar, John Bell and Brian Guetzlaff will explore the advanced capabilities of Caringo Swarm’s Content Management API, including managing user access, usage and content (using collections and metadata). They will provide a live demonstration and show you how to use the Swarm Object Storage Content Portal User Interface (UI). Attendees will also have the opportunity to ask questions throughout the webinar. Video production workflows are evolving rapidly to satisfy on-demand requirements. Production timelines are compressing and content needs to remain online and accessible for indefinite lengths of time. This has introduced the need for more “tiers” of storage. In this webinar, Nicholas Smith, JB&A Director of Media Technology, and Adrian “Aj” Herrera, Caringo, VP of Marketing, will give an overview of the 5 tiers of storage for any new video production workflows—covering super-fast storage for editing to economical storage on-prem or in the cloud and everything in between. Do you need to securely store data and access it via NFS? In this webinar, John Bell and Michael Brame will discuss using NFS with object storage and explain how this has been handled by traditional file-to-object gateways. They will also do a live demo of Caringo SwarmNFS—the first lightweight file protocol converter to bring the benefits of scale-out object storage to NFSv4, seamlessly integrating files and object storage. Join Sr. Consultant John Bell and UI Engineer Brian Guetzlaff for a tour and demo using the Swarm Object Storage user interface (UI) to manage a storage cluster. They will also provide insight into the management API that underpins the user interface and discuss the capabilities of the platform. Massive scalability is one thing, but what if you want to run Object-Based Storage for a smaller shop? Can you start with a small hardware investment and run object-based storage on just one server? John Bell, Sr. Consultant, and Jamshid Afshar, Caringo Engineer, will explain how you can store, manage, search and deliver data with just one server, while maintaining the ability to scale out by simply plugging in additional servers as your data storage needs grow. They will explain how this “pay-as-you-grow” model can benefit organizations as they start to outgrow traditional SAN, NAS and Tape storage solutions. Join Caringo CEO Tony Barbagallo and VP Marketing Adrian “AJ” Herrera as they talk about what is new in Swarm 10, a landmark release that enhances every part of the Caringo product suite with unrivaled performance and cost-savings enabled by our unique pure-object approach. Learn how Caringo has set a new precedent in on-premises object storage with blazingly fast S3 throughput and sustained petabyte-scale NFS to object read and write—all on standard hard drives, server and networking infrastructure. Get behind-the-scenes’ insight into how to migrate data from SAN, NAS or tape to an Object-Based Storage solution. John Bell, Sr. Consultant, and Eric Dey, Director of Product Management, will share their experience from hundreds of successful object storage implementations. They will explain the ins and outs of the data migration process and share best practices to help you move from a limited traditional storage approach to the new, cost-effective, limitless storage paradigm of object storage. Changes in content creation workflows and access patterns of content creators and end users are stressing every aspect of the traditional Media & Entertainment (M&E) storage workflow. Do you invest in high-performance storage first, or enable protection, distribution and petabyte scale with object storage? How much of each solution is needed and how can you predict usage and growth to properly size each solution? And once you do this, how do you ensure operability throughout the entire M&E workflow from creation to management to archive? In this webinar Barry Evans, Pixit Media’s CTO and Adrian Herrera, Caringo’s VP of Marketing will demonstrate how to solve these challenges through a complete software-defined storage (SDS) approach combining Pixit Media’s PixStor and PixStor Ngenea Hierarchical Storage Management (HSM) solutions with the Caringo Swarm scale-out object storage platform. Just what is object storage? CEO Tony Barbagallo and VP Marketing Adrian “AJ” Herrera get back to basics to explain what object storage is, how it compares to traditional file and block storage, and when object storage is the right solution for your data center. Tony and AJ will explore the challenges with data that motivate organizations to adopt object storage such as risk of data loss, data growth, the limitations of traditional technologies, and the expectation of always-on and accessible storage. They will explain how object storage can help organizations overcome these challenges by eliminating inefficient data silos and providing continuous built-in data protection, searchability and management capabilities. You've heard about the many benefits of object storage, but do you know which one is the right solution for your use case and organization? Object storage experts John Bell, Sr. Consultant, and Ben Canter, VP Global Sales, will discuss the criteria that should be used when evaluating object storage solutions for various use cases and share the knowledge gleaned from the 100s of successful installations Caringo has managed over the past dozen years. This interactive presentation will be followed by a live Q&A so you can ask questions that address your specific areas of interest. When it comes to High-Performance Computing (HPC), the volume of data that comprises data sets can easily over-burden primary storage. When that happens, performance and speed are compromised and research and business objectives are at risk. As data sets continue to grow, more and more HPC organizations are turning to object storage technology to build active archives. Learn how adding cost-effective object storage into your storage infrastructure can reduce storage TCO, provide continuous data protection, and give you the power of metadata so you can quickly retrieve data when you need it. The nature of enterprise data is rapidly changing and existing storage infrastructures can’t keep up. Network Attached Storage (NAS) devices were designed for performance and single-site collaboration but file creation and access is different now. Many turn to the cloud to offload data, however, for rapidly scaling data sets, daily transfer rates and bandwidth constraints are an issue. In addition, some sensitive information can’t leave your data center. Komprise and Caringo have partnered to solve these issues by pairing intelligent data management technology with hassle-free, limitless storage. Attend this webinar to learn how you can slash TCO for rapidly scaling data sets by identifying data to move from NAS. Then securely transferring it based on value to Caringo Swarm scale-out object storage were it is protected without backups and instantly and securely available internally or externally. To keep pace with today’s media and digital asset management workflows, you need a cost-effective secondary tier of storage (active archive) that provides instant accessibility and unrelenting data protection—while scaling to store petabytes of unstructured data and billions of files. Caringo Senior Consultant John Bell and Engineer Jose Juan Gonzalez will explain how object storage (using NoSQL, unstructured methods of search like Elasticsearch, and advanced metadata and content management capabilities) can be used to build this active archive and will illustrate use with a live demo of how Caringo Swarm integrates with leading industry tools such as the CatDV media asset management (MAM). With insatiable growth of research storage demands, traditional storage solutions have ceased being cost-effective or viable. Konstantinos Mouzakitis, Senior HPC Systems Engineer at Boston Limited (a leading system integrator in the UK and EU) and Caringo Object Storage Solutions Architect Alex Oldfield talk about the benefits of using object storage in HPC use cases in this webinar. No organization wants to lose data or waste precious time searching for it when it is needed. And, we all know the costly ramifications of failing to comply with governmental regulations: HIPAA/HITECH, PCI, Freedom of Information Act, GDPR, and many more. Join Jacques Sauvé, IGP of NetGovern, a leader in Information Governance software, and Ben Canter of Caringo, secure scale-out storage, to learn how compliance with current, large rapidly scaling data sets requires tighter integration between information governance and underlying storage infrastructure. Elasticsearch is a distributed, RESTful search and analytics engine that can be used with object storage to enhance searchability with metadata, enabling you to search billions of files ad hoc with "Google-like" search capabilities, without the rigid structure of relational databases and file systems. Caringo Senior Consultant John Bell and Caringo Engineer Jamshid Afshar take an in-depth look at best practices for using Elasticsearch with object storage and demonstrate use of Elasticsearch with Caringo Swarm Object Storage in this webinar. Caringo was founded in 2005 to change the economics of storage by designing software from the ground up to solve the issues associated with relentless data growth. Caringo’s flagship product, Swarm, decouples data from applications and hardware providing a foundation for continued data access and analysis that continuously evolves while guaranteeing data integrity. Today, Caringo software-defined object storage solutions are used to preserve and provide access to rapidly scaling data sets across many industries.